2Centro de Investigación en Materiales Avanzados, Chihuahua, México. Received February 16th, 2011; revised March 30th, 2011; accepted April 6th, 2011.
fluorescing aggre gat es associated with the act i vat i o n of carot e n oi ds rad i cal s.
tivity are made in the present. photochemical hole burning, etc [2,3]. over a period of three to four months. cations of chlorophyll’s optical properties [5-7]. transfer the energy through photosynthetic apparatus. the pigments embedded into the inorganic matrix. 710 nm corresponding to chlorophyll b [8,10]. pigment, and the a/b ratio is generally around 3 to 1 .
cence of chlorophyll b are at 650 nm and 710 nm [10,12]. cence originates from PSII [10,13]. transfer to the photosystem II, is at about 683 nm . embedded in the thylakoid membranes of green plants. by simple grinding and mixing them with ethanol solvent. then filtered with a Wattsman filter nr. 1.
ing material. The pH of the final solution was 5.
pieces were ground to form a fine powder. in a fluorescence spectrometer by Ocean Optics Inc.
obtain a great biostability for su ch formation parameters. denaturalizati o n occu rs a s we di scuss in next paragra ph. gelling and after 36 months of gelling. 12 months was observed . 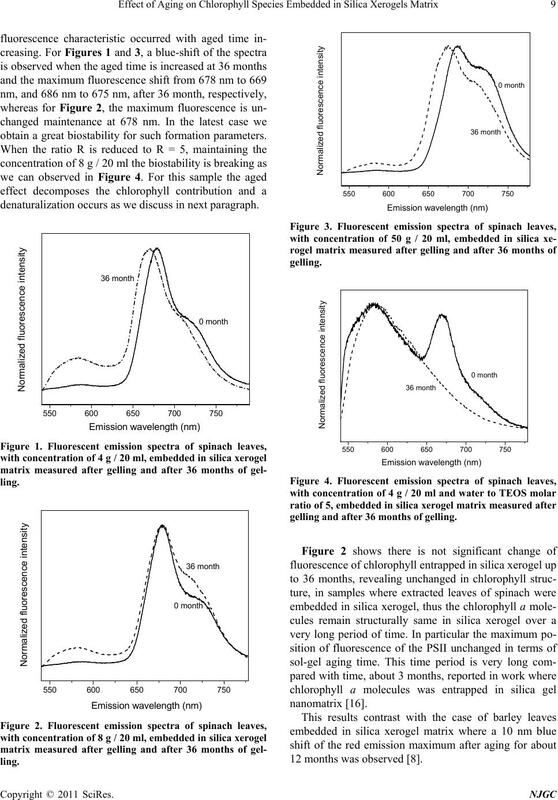 bioactive over very l ong periods of time. located at 726 nm to 713 nm. H2T(o-NH2)PP, embedded in SiO2 matrix . indicated by the blue shift band located at 583 nm . concentration C2, as we can observe in Figure 6.
after 36 months of gelling. the activation of carotenoids radical s.
main bioactive ov er a long period of time. Optics, Vol. 5, No. 5, 1996, pp. 621-629. Proceedings of SPIE, Washington, Vol. 1328, 1990, pp. No. 18, 1999, pp. 2462-2466. No. 1, 2007, 8 pages. Science: Materials in Electronics, Vol. 8, No. 1, 1997, pp. No. 6, 1994, pp. 1081-1089. Vol. 33, No. 2, 1995, pp. 481-486. 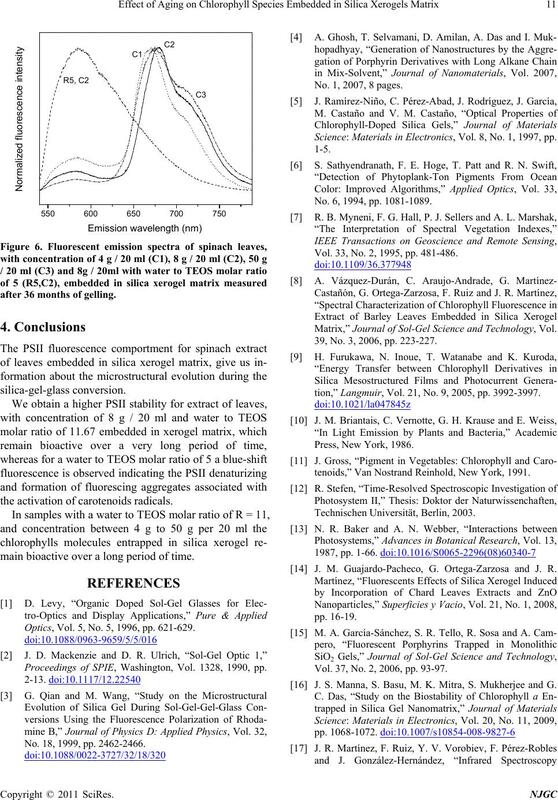 Matrix,” Journal of Sol-Gel Science and Technology, Vol. 39, No. 3, 2006, pp. 223-227.
tion,” Langmuir, Vol. 21, No. 9, 2005, pp. 3992-3997.
tenoids,” Van Nostrand Reinhold, New York, 1991. 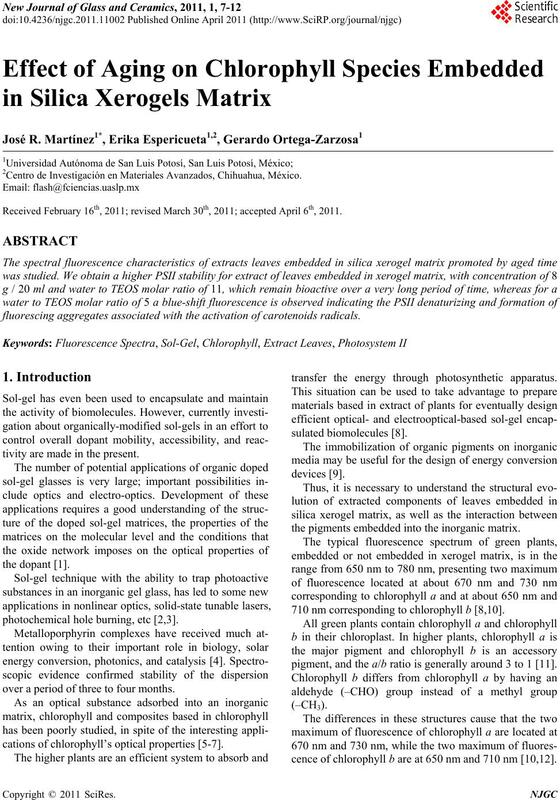 J. M. Guajardo-Pacheco, G. Ortega-Zarzosa and J. R.
Vol. 37, No. 2, 2006, pp. 93-97. 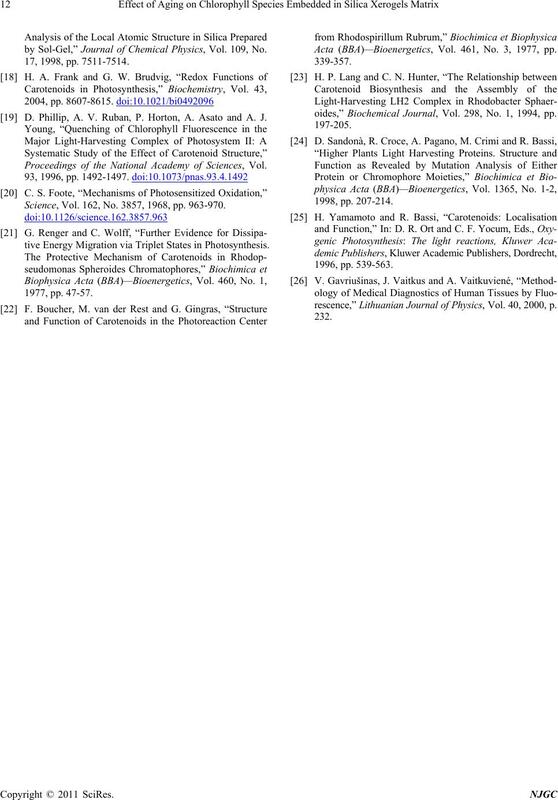 J. S. Manna, S. Basu, M. K. Mitra, S. Mukherjee and G.
by Sol-Gel,” Journal of Chemical Physics, Vol. 109, No. D. Phillip, A. V. Ruban, P. Horton, A. Asato and A. J. Science, Vol. 162, No. 3857, 1968, pp. 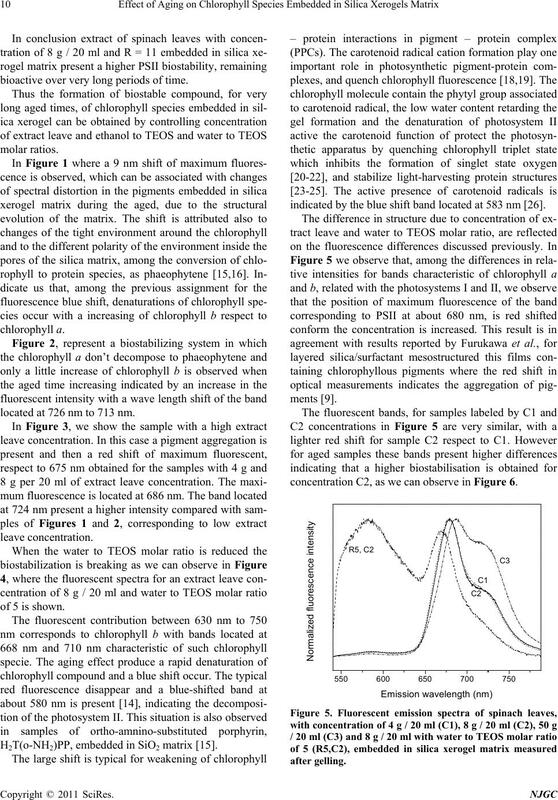 963-970.
tive Energy Migration via Triplet States in Photosynthesis. Acta (BBA)—Bioenergetics, Vol. 461, No. 3, 1977, pp. oides,” Biochemical Journal, Vol. 298, No. 1, 1994, pp. 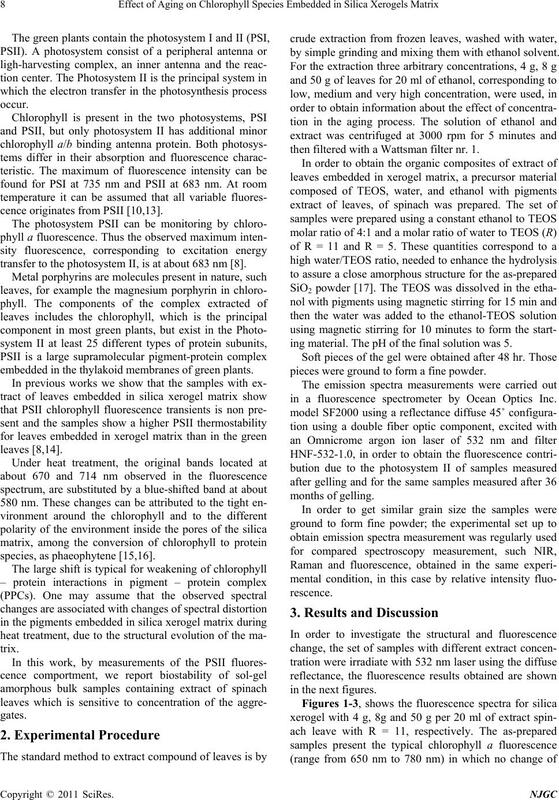 rescence,” Lithuanian Journal of Physics, Vol. 40 , 2000, p.